Lyn Cote married her real-life hero and was blessed with a son and daughter. She loves game shows, knitting, cooking, and eating! She and her husband live on a beautiful lake in the Northwoods of Wisconsin. Now that the children have moved out, she indulges three cats: V-8 (for the engine, not the juice), Sadie, and Tricksey. In the summer, she writes using her laptop on her porch overlooking the lake. And in the winter, she sits by the fireplace her husband installed with the help of a good neighbor during their first winter at the lake. Lyn's inspirational novels feature American women who step up to the challenges of their times and succeed in remaining true to the values of liberty and justice for all. 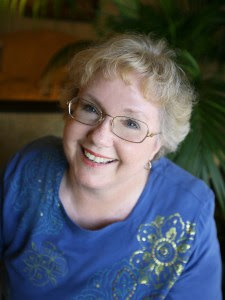 The story of America is one of many nationalities and races coming together to forge our one nation under God, and Lyn's novels reflect this with accurate historical detail, always providing the ring of authenticity. Strong Women, Brave Stories. A New Orleans lady and a half-breed frontiersman become unlikely allies as they travel the wilds of Texas. 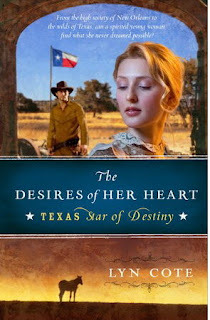 In 1821, when circumstances make it impossible for her to remain in New Orleans, Dorritt and her family head west to join Stephen Austin's settlement and recoup their fortune in Texas. Quinn is a man of the frontier who has made a name for himself as a peerless scout. But as he and Dorritt's party begin a grueling trek across untamed Texas, the success of their journey is in grave doubt. Mexico has broken with the Spanish Crown, and armies from both countries—plus marauding Comanches—roam the pine forests and prairies. And one of the party is plotting destruction. Now, with their lives joined in a virgin land fraught with peril, can Dorritt and Quinn put all their trust in God and receive the desires of their hearts? I must admit that I enjoyed my book reviewing break so much that I didn't realize it was almost February and this book was up immediately! It looks good if you like historical romantic fiction (which I usually do!). Your comment on my giveaway intrigued me and brought me here. I like what I've found! I grew up in WA, and I'm missing it so much now that I'm going to grad school in Ohio. And Mercedes DOES make a sports car. I believe that some version of the Mercedes McLaren was the fastest street legal car at some point.